This product contains ceramides with both hydroxy and non-hydroxy fatty acids. 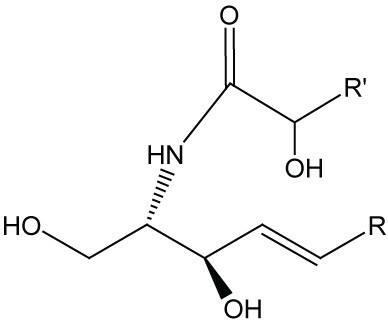 Ceramide is a fatty acid amide of sphingosine. Ceramide functions as a precursor in the synthesis of sphingomyelin, glycosphingolipids, and of free sphingosine and fatty acids. The sphingosine can be phosphorylated to form sphingosine-1-phosphate. Two of ceramide’s metabolites, sphingosine-1-phosphate and glucosylceramide, produce cell proliferation and other cellular functions.1 Ceramide exerts numerous biological effects, including induction of cell maturation, cell cycle arrest, terminal cell differentiation, cell senescence, and cell death.2 Because of these effects ceramide has been investigated for its use in cancer treatment and many potential approaches to cancer therapy have been presented.3 Other effects include producing reactive oxygen in mitochondria (followed by apoptosis) and stimulating phosphorylation of certain proteins (especially mitogen activated protein). It also stimulates some protein phosphatases (especially protein phosphatase 2A) making it an important controller of protein activity. 2-hydroxy fatty acid ceramides are especially abundant in nervous and epidermal cells. These ceramides are important for the permeability barrier function of epidermis and the lipid organization in membranes. The 2- hydroxylation is catalyzed by fatty acid 2-hydroxylase (FA2H or fatty acid alpha-hydroxylase).